The world seems to be increasingly calling for a revolution. Self-proclaimed revolutionaries are appearing all over the place—on football sidelines, on college campuses, in marches, and at political rallies. Revolution is their rallying cry. The problem is not that they want revolution. The problem is that they want the wrong revolution, and their desired revolution doesn’t go far enough. You see, Believe it or not, Jesus calls you and me to be revolutionaries, to be change agents. Of course, He’s not calling us to some worldly revolution. He wants to use us to bring about a good revolution, a godly revolution. We get this calling to be a revolutionary change agent in Matthew 5:13-16, “You are the salt of the earth, but if salt has lost its taste, how shall its saltiness be restored? It is no longer good for anything except to be thrown out and trampled under people’s feet. 14 “You are the light of the world. A city set on a hill cannot be hidden. 15 Nor do people light a lamp and put it under a basket, but on a stand, and it gives light to all in the house. 16 In the same way, let your light shine before others, so that they may see your good works and give glory to your Father who is in heaven. So, here in this passage, Jesus says that you and I are metaphorically to be two things: salt and light. While those two things are very different, they share one major commonality: they change their environment. Salt changes its environment by flavoring, preserving, melting, and healing. Light changes its environment by brightening and heating. So, while the metaphors are different, they are both calling us to the same thing, being revolutionary change agents in our community. 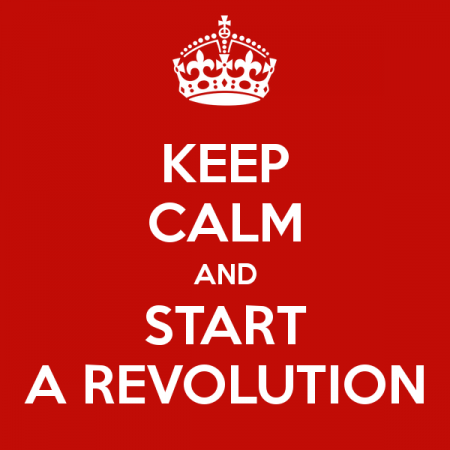 So, how do we go about being a revolutionary change agent? How do change the world? Jesus says we do this by doing good in Jesus name, In the same way, let your light shine before others, so that they may see your good works and give glory to your Father who is in heaven. Our light is our good works. By extension, our salt is our good works as well. Jesus just as easily could have said, In the same way, sprinkle your salt on others, so that they may taste your good works and give glory to your Father who is in heaven. So, let’s get outside these church walls and do good in Jesus’ name. Do good through your words: tell people about Jesus, encourage, counsel, rebuke, and console. Do good through your actions: show kindness, give love, and be a neighbor and a friend. They say they want a revolution. Let’s be salt and light and give them a good revolution, a revolution in Jesus’ name!